Edema is swelling that occurs when there is an excessive amount of fluids within the intracellular space, typically within subcutaneous tissues. Edema is more commonly experienced in the lower extremities and other areas that are farther from the heart. Edema may be dependent, caused by gravitational forces on the fluids that are greater than the mechanisms designed to overcome these forces. Edema may also be generalized throughout the entire body or localized, restricted to a single area. Physical characteristics of edema include soft swelling of tissues that leaves an impression when pressed and tight or stretched skin.1,2 Severe cases of edema may cause weeping as fluids move through the skin from the tissues. Edema can be caused by a variety of mechanisms, and its treatment is influenced by the causative factor. Decreased cardiac output, especially congestive heart failure, is a common cause of edema.2,3 As preload is increased and venous return is inhibited, there are increased fluids in the vascular space, particularly distal and inferior to the heart. The fluids leak out into the intracellular space, thus leading to edema that starts in the lower extremities. Decreased venous return can also lead to peripheral edema.3 As the valves in the veins fail to promote unidirectional flow toward the heart, fluids will not return to the heart as normally expected and will build up, creating dependent edema. Edema may also be caused by dysfunction of the lymphatic system secondary to pathological processes or surgical interventions.2 The physiological purposes of the lymphatic system are to remove intracellular fluids and to return these fluids (referred to as lymph while in the lymphatic system) to general circulation through the lymphatic vessels that include several filtering lymph nodes. Any disease process or surgical intervention that impedes flow of lymph will cause the interstitial fluids distal to that impediment not to be adequately returned to general circulation. This process causes a buildup of fluids and can lead to edema distal to that site. Localized edema may occur as a natural response to an insult or injury. The inflammatory process creates increased venous permeability at the site of the injury to facilitate the transfer of immune cells and other inflammatory factors to that site. Localized edema typically spontaneously resolves as the inflammatory process progresses and the initial insult or injury begins to convalesce. Increased venous permeability resulting from a pathological process can also lead to edema, typically generalized edema.2 The disorders that cause this type of edema include anaphylaxis and septicemia. Both of these conditions cause a reaction that leads the veins to allow fluids to seep from the veins into the surrounding tissues, thereby causing edema throughout the body. Finally, edema can be caused by changes in the tonicity of the blood.2 Molecules such as albumin and electrolytes decrease the osmotic pressure within the blood vessels, thus drawing fluids from the interstitial spaces into blood circulation.3 Any disorder affecting the production or regulation of albumin or electrolytes can cause an increase in the osmotic pressure within the intravascular space and can lead to retention of fluids within the interstitial spaces. Treatment of edema should first include treating the underlying causative factor if possible. Edema that is caused by excessive amounts of fluids or fluids that are not adequately returned to the heart may be treated using a diuretic. Diuretics increase the amount of fluid excreted during urine production and reduce the amount of fluid within the body.2 Limitation of fluid intake may also be indicated if fluid retention is the cause of edema. 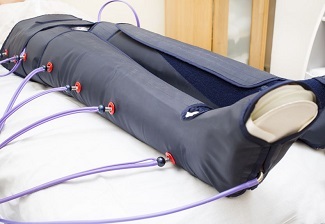 Dependent edema may be treated using compression stockings or sequential compression devices.4 These sequential compression devices promote blood return by enhancing unidirectional venous flow toward the heart and may be especially useful in patients with decreased venous return or in patients with decreased cardiac output. Elevating the affected extremity or extremities above the level of the heart also promotes the reduction of dependent edema. Edema that is caused by surgical or pathological disruption of the lymphatic system is difficult to treat.3 Compression of the extremity or elevation of the extremity above the heart may help to reduce edema caused by malfunction of the lymphatic system. The best way to approach edema resulting from disruption of the lymphatic system is to avoid any localized insult or injury distal to the site of lymph impediment that may create edema in this area. It is best practice to avoid taking blood pressures and drawing blood distal to the site of a pathological or surgical disruption of the lymphatic system. Edema is a common disorder with numerous causes. Although the various methods of treating edema may be helpful for most patients, it is typically best to treat the underlying cause of the edema to prevent the development of further edema. 1. Brodovicz KG, McNaughton K, Uemura N, Meininger G, Girman CJ, Yale SH. Reliability and feasibility of methods to quantitatively assess peripheral edema. Clin Med Res. 2009;7(1–2):21–31. 2. Cho S, Atwood JE. Peripheral edema. Am J Med. 2002;113(7):580–6. 3. Ely JW, Osheroff JA, Chambliss L, Ebell MH. Approach to leg edema or unclear etiology. J Am Board Fam Med. 2006;19(2):148–60. 4. Wilkins RW, Mixter G, Stanton JR, Litter J. Elastic stockings in the prevention of pulmonary embolism; a preliminary report. N Engl J Med. 1952;246(10):360–4.